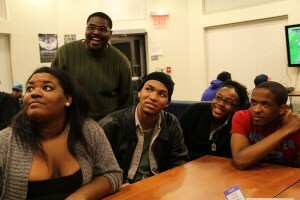 Sigma Week kicked off with game night in the Greek Community Center. Hosted by the Phi Alpha chapter of Phi Beta Sigma, the sound of dance music filled the room while students were presented with the card game Spades, Taboo, and sports video games. Spades was one of the games featured for the night. 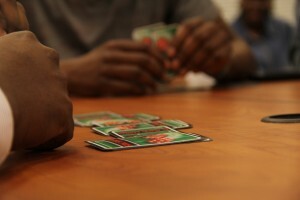 The Spades table became intense as the games progressed, but players seemed to lighten up afterwards. The Taboo players were making a lot of noise across the room as the teams tried to guess the unmentionable words. Teams were divided by gender and it quickly became a battle of the sexes. There were two stations of video games. The players had a choice between FIFA 2013 or NBA 2K13. Trash talk was given and received in plentiful amounts. Listening intently to guess the word in a game of Taboo. Upcoming events for Sigma week include: “The Congressional District” in the Student Center Courtyard on Tuesday, “The Private Sector”, an invite only event on Wednesday, “Blue Light Café” in the Speakers Auditorium on Thursday, “District 1914,” a brotherhood event on Friday, and to cap it off, “The Public Sector,” a service project on Saturday. All of the events begin at 7:14pm except for the service project.